Okra is a vegetable native to Egypt, where it has been grown since the 12th century. Okra or okro, known in many countries as ladies' fingers, ochro, okoro, quimgombo, kopi arab, ngombo and quingombo. The okra pods of the plant are mucilaginous, resulting in the characteristic "goo" or slime when the seed pods are cooked; the mucilage contains soluble fiber. Mucilage is edible. It is used in medicine as it relieves irritation of mucous membranes by forming a protective film. How Do You Get The Slime Off Of Okra? 1) Freeze the Okra. The preparation phase affects how slimy the okra is when cooked or served. Put the okra pods in the freezer for 10 minutes before cutting or slicing. This will prevent release of slime when sliced. 2) Soak the Okra in Any Type of Vinegar. A food hack for reducing sliminess is to soak the okra in vinegar before cooking it. The University of Illinois Extension Program suggests soaking the okra in vinegar for 30 minutes before you prepare it. Rinse the okra with fresh water and pat the pods dry after the vinegar soak. You can pre-cook okra at very high heat by sautéing, roasting, blanching or grilling. Then add cooked okra to your recipe and there will be hardly any slime at all. 3) Use the Correct Cooking Method. The cooking technique also affects how much slime forms on the okra. Cooking methods that use high heat to cook the okra quickly help you achieve slime-free okra. Frying is a popular cooking method for okra that reduces slime. Try searing the okra in a small amount of hot oil in a pan. Grilling is another high-heat source for cooking okra. Slide the okra pods onto skewers so they don't fall through the grates. 4) Avoid Over Cutting of the Okra Pods. Cutting okra releases the slime. Keep cutting to a minimum unless required for the recipe. Recipes that call for whole okra makes it less slimy because the pod isn't cut extensively. 5) Avoid Overcooking. When okra is overcooked it loses flavor and texture. Overcooking okra tends to increase the sliminess, according to the Centers for Disease Control and Prevention on their Fruits and Veggies Matters website. Follow the cooking procedure in the recipe. The cooking time differs slightly with different cooking appliances or amount of heat applied. You can rely on visual signs to determine when the okra is cooked. Choose from the best recipes so that you can add okra to your diet. Okra goes great in a soup, stew, and gumbo or fried. In a 12-inch skillet over high heat, heat the 2 tablespoons vegetable oil. Add the okra; reduce the heat to medium, and sauté the okra until slightly browned and much of the slime has dried out, about 45 minutes. Put the okra in the seafood stock. 4. Meanwhile, heat the bacon drippings in a large skillet over medium-high; add the okra, and cook, stirring often, until the okra is no longer sticky and mushy, about 20 minutes. Add the okra, reserved duck meat, shrimp, oysters, and oyster liquor to the stock mixture; cook about 10 minutes. Add okra slices and sauté for 10 minutes, stirring carefully and often. Reduce heat to medium low, cover leaving lid ajar, and continue to cook until okra becomes golden, 15 to 20 minutes. Using a slotted spoon, transfer okra to a plate. 2. Pour the oil to a depth of 2 inches into a Dutch oven; heat to 375°F. Fry the okra, in batches, 7 to 10 minutes or until crispy and deep golden brown; drain on paper towels. 3. Bring the mixture in the pot to a boil, add the corn, okra, and lima beans, reduce the heat to low, and cook for 30 minutes, stirring from time to time. Remove the ham hock with a slotted spoon and, when cool enough to handle, bone, shred the meat, and return the meat to the pot along with the reserved chicken. 3. Now add the okra, salt, sugar, and lemon juice and stir; bring to a gentle simmer. Add water if needed to cook okra. HEAT WATER: Fill 12¬inch nonstick skillet nearly to rim with water, add 1 teaspoon salt and 2 tablespoons vinegar and bring to boil over high heat. Stir corn over moderate heat until it thickens; add 1/2 cup okra water leaving wooden spoon or cou cou stick in mixture. Cook over low heat till done; spoon will come out clean. 2. Meanwhile, cook sauerkraut, remaining 2 tablespoons vinegar, and sugar in 12-inch nonstick skillet over medium-high heat, stirring occasionally, until liquid evaporates, about 3 minutes; transfer to bowl. Wipe out skillet with paper towels. Fry the chicken pieces in butter until yellow. Add grated onion, boiled and strained tomatoes, salt, sugar and the okra (which were rinsed several times after removal from the salt-vinegar water). Simmer, covered, until the okra are almost done. Add all other ingredients and cook for 15 to 20 minutes over medium heat, stirring frequently, until corn and okra are tender to the bite. Serve over steamed rice. 10. Pour the reserved liquid in the baking dish into a small saucepan, place over medium-high heat, and bring to a gentle boil. In a small bowl, stir together the crème fraîche and cornstarch. How to Buy and Store Okra? When purchasing okra, make sure the skin or outer layer is free from blemishes, brown spots, and is hard when squeezed. When storing at home, keep in an open paper bag or container in the fridge for up to one week. You can tell if okra has gone bad by inspecting the firm green pods - if they're soft, squishy, brown, throw them away. Be aware that depending on how it's prepared, good okra may take on a slimy texture when cooked, but this doesn't indicate spoilage. What are Okra Health Benefits? Okra is low in calories but provides a high amount of vitamin B6 and vitamin C. It also provides a high amount of fiber, calcium and folic acid. 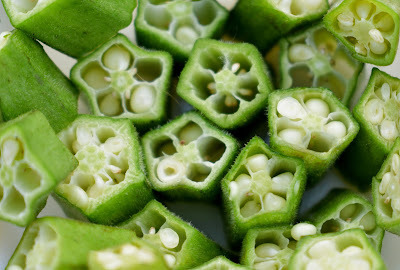 Raw okra is 90% water, 2% protein, 7% carbohydrates. In a 100 gram amount, raw okra is rich (20% or more of the Daily Value, DV) in dietary fiber, vitamin C and vitamin K, with moderate contents of thiamin and magnesium. Vitamin C – Habitual eating of foods rich in vitamin C aids the body develop resistance against infections and removes harmful, pro-inflammatory free radicals. Vitamin C also helps to stop respiratory problems such as asthma and lung cancer. Vitamin C has been revealed to reduce blood pressure, and therefore lessen the probability of hypertension. Vitamin B6 – Vitamin B6 helps to keep your immune system in superior working condition. It assists in the breakdown of fats, carbohydrates and amino acids while helping to maintain the health of lymph nodes. In addition, vitamin B6 helps to normalize blood glucose levels.